The northern zone of this belt borders the East European platform in the west and is linked to the Urals.-Okhotsk belt in the east. It is represented by the young Epi-Paleozoic Plates: Skythian, within the limits of the Crimean plain, Sea of Azov, Cis-Caucasus, and the northern part of the Caspian basin, and the Turanian eastwards from the Caspian Sea (Khain, 1984). The Skythian Plate joins the ancient platform along a deep-seated tectonic suture, a zone of structural terraces within the basement, rapidly sinking down southwards to a depth of 9 km. Above this zone is a system of grabens formed in the Permian-Jurassic. The Turanian and Skythian Plates' basement consists of a number of rigid crystalline massifs of pre-Baikalian or Baikalian age, often intruded by early Paleozoic granites. The massifs are well outlined by isometric magnetic and gravitational anomalies, while comparatively narrow zones, formed by volcanogenic and carbonate-terrigenous Paleozoic fold sediments, which divide them, are characterized by linear contrasting anomalies. The complex of grey and red-coloured molasse sediments of the middle and upper Carboniferous, but mainly Permian and lower Triassic, is widely spread both on the Skythian and Turanian Plates, forming isometric basins or grabens. These sediments inconsistently overlap all the more ancient formations. The formation of the platform cover began in the early Jurassic, and by-and-large, can be divided into three complexes: (1) Riphean-lower Jurassic; (2) middle Jurassic-lower Miocene; and (3) middle Miocene-Quaternary. All are formed by terrigenous-carbonate sediments with a thickness of a few kilometres and are deposited almost horizontally. Locally, however, they form grabens, within which the sediment thickness increases to 8-10 km. South of the Epi-Paleozoic plates of the Mediterranean belt the Alpine fold structures of the Crimea, Caucasus, Kopetdagh, and Pamir are located. The Crimean mountains represent half of a large arch uplift, the southern part of which is located beneath sea level. The fold basement of the Crimean mountains (first complex) is formed by the terrigenous flysch of the middle Triassic-lower Jurassic as well as by similar sediments of the middle Jurassic, locally with volcanites, overlapping them inconsistently. The second complex is represented by the terrigenous-carbonate series of the upper Jurassic, and the third by the sandy-clayey and carbonate series of the lower Cretaceous-Quaternary. The fold area of the Caucasus correlates with the maximum intersection of the Alpine fold belt within FSU boundaries (Figure 1.10). From north to south the zone of the Cis-Caucasus foredeeps is distinguished, formed by late Miocene-Quaternary molasses; the Greater Caucasus uplift stretching latitudinally for 1250 km, and having a sharp asymmetry, with steeply sloping and narrow southern slopes and wide and gently sloping northern slopes. Within the Greater Caucasus core the Riphean and Paleozoic rocks with ophiolites are stripped, marking the relicts of the Paleotethys. The Alpine basin proper is formed by thick (up to 8-9 km) flysch terrigenous and carbonate sediments of the lower Jurassic to lower Miocene, but without inclusion of ophiolite, indicating that ocean crust was absent within the basin. The folding began in the Miocene, and from the late Miocene arch uplift formed, as well as foredeep molasse basins. Owing to the subduction of the Transcaucasian massif (microcontinent) beneath the Greater Caucasus structure, its southern slope is complicated by thrust faults and sheets as well as complex folds, overturned towards the south (Figure 1.11). The fold structure of the Lesser Caucasus relates to the inner zone of the Alpine belt and consists of a number of fold zones, alternating with each other. The Sevan ophiolite sublatitudinal zone, consisting of Jurassic ophiolites, which were transformed into a tectonic melange at the end of the late Cretaceous, is of prime importance. The Sevan suture marks the Mesozoic Tethys Ocean, closed in the late Cretaceous. To the south, Gondwanaland elements are located. The extensive development of volcanogenic flysch sediments is the specific feature of the Lesser Caucasus. The Transcaucasian intermountain zone consists of the Rioni and Kura basins, formed by Neogene-Quaternary molasses. 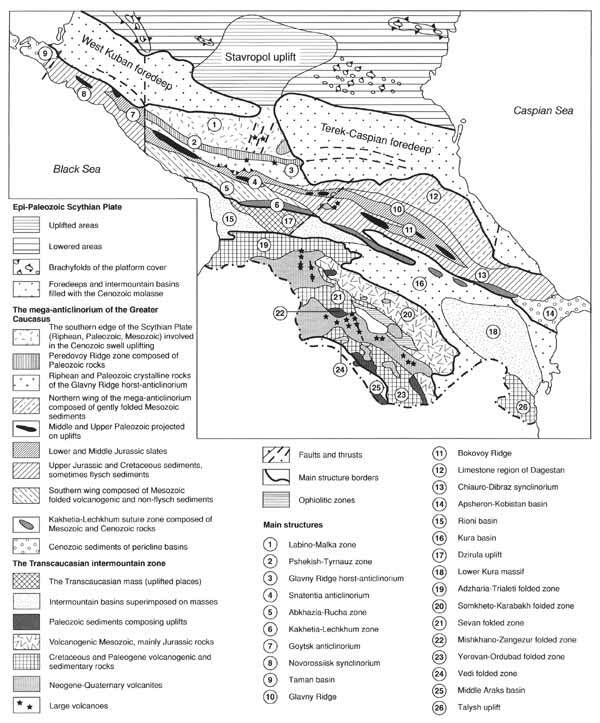 The orogeny of the Caucasus, as well as the rise of the mountain-fold structure, was accompanied by intense calc-alkaline volcanism of the collision type, with the formation of the Greater Caucasus deep ignimbrite calderas of the Upper Chegem type, and large stratovolcanoes (Elbrus and Kazbek) in the Greater Caucasus and Aragats in the Lesser Caucasus. 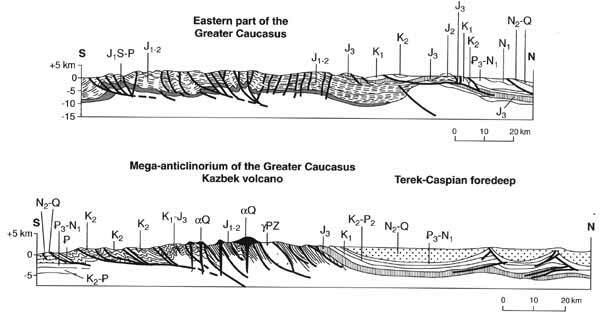 The crustal thickness within the Greater Caucasus is as much as 55 km, decreasing to 40 km within the Transcaucasian zone and 45 km within the Lesser Caucasus (Milanovsky and Koronovsky, 1973). To the east of the Caspian Sea, in Turkmenistan, the Alpine mountain-fold structure of Kopetdagh, with heights of up to 2 km, stretches as a narrow line. It is formed by the red-coloured rocks and volcanites of the Permian and Triassic, terrigenous rocks of the lower Jurassic and terrigenous-carbonate rocks of the middle Jurassic to Eocene with a thickness of up to 9 km, crumpled into simple box folds. The foredeep is located in front of the mountains, formed by Oligocene-Quaternary molasses of up to 4 km in thickness. The deep-sea graniteless troughs of the Black Sea and southern Caspian are within the limits of the Alpine belt of FSU territory. The sediment thickness within the trough reaches 15 and even 20 km. Especially important is the South Caspian trough, which is rimmed by young structures of the Kura and West Turkmenian basins, deflecting to the south. The eastern link of the Mediterranean belt is the Pamir Alpine structure, which is subdivided into six different structural zones, formed both in the Hercynian and Kimmerian. In comparison with typical alpides, the final folding here occurred earlier — in the middle or late Jurassic. However, intense sheet and thrust-fault formation resumed in the Cretaceous and Neogene, providing the similarity of the Pamir with other Alpine structures of the belt. The Pamir possesses a crust up to 70 km thick. Westwards from the Pamir, within the outer part of the Mediterranean belt, is the Tajik basin, which is superimposed over the Precambrian and Paleozoic basement. The basin is formed by terrigenous-carbonate, salt-bearing and continental molasse sediments up to 13 km thick, which were crumpled into disharmonic folds, detached along the upper Jurassic salt-bearing rocks (Bekker, 1996). Thus, the Mediterranean belt originated in the late Precambrian to Riphean and developed in the Paleozoic, Mesozoic, and Cenozoic. The main feature of the Alpine history was the progressive closing of the central part of the Tethys Ocean, which divided the African-Arabian and Eurasian Plates. The southern periphery of the latter was always active, while the northern Gondwanaland Plate was passive. The collision, which occurred in the late Cretaceous, when the last basins with ocean-type crust closed, continues up to the present, causing an increase in the stress state of the Earth's crust and strong earthquakes.